Ideas, curiosity, plans, exploration, discovery, inspiration, alert, honesty. Curious and playful, Raccoon loves to explore every nook and cranny of his terrain, and he doesn’t hesitate to go after what he wants. Brimming with ideas, he’s a messenger who is adept at solving mysteries. Raccoon is your guide in the craft of exploring new ideas and how to best act on them. With his bright and alert ways, he’ll keep you on your toes. Fresh concepts are surfacing as shifts are taking place within and around you. In the process of renewing clarity of mind, a boundless quest for knowledge will break through old programming, making room for new thoughts and viewpoints. 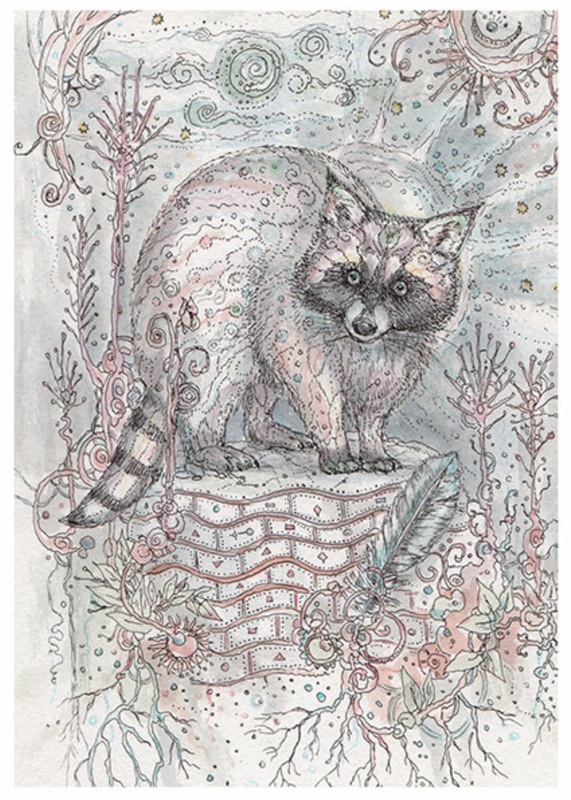 This entry was posted in Artist, Deck Review, Featured Card of the Day, General Tarot, Readings and tagged Page of Feathers, Paulina Cassidy, Raccoon, Spiritsong, Tarot.